I believe that joy, love and laughter are fundamental things in life, for they enable you to maintain a healthier life and a spiritual harmony. “Born In The Wrong Country” is about feeling unwelcome in your own country and how this makes you feel when looking at foreigners who are welcomed with open arms. Unlike foreigners who go periodically to Ellis Island to trace their ancestry; the African-American People of Color must look at a different route, that of the slave trade route, what is known as the Middle Passage in order to see how their ancestry was brought in chains to a foreign land to continue being beat and mistreated. “Born In The Wrong Country” is also about the love and support needed in parenting gay children, standing beside them and loving the gifts that God gave you. It is about gay people who want and need what everyone else does, love and respect. "Born In The Wrong Country" is about what the United States of America has neglected to do, things that this government have ignored when it comes to its own people. It deals with the White and the Black situation in America, the poor and other minorities, and of the hunger that faces the people of the United States. Mental hunger and physical hunger of what people want, and what people need are discussed. It doesn’t just talk about today, but talks about the African-American People of Color in this country, and what this country has done to them. It points out how this government has taken away the spirit of a people, and possibly thrown away gifts, many gifts that could have possibly been given for the whole world to see and benefit from. Born exposes the reality of slavery and the kind of terrorism that went on throughout that slavery, a terrorism which was done so well that it did exactly what terrorism was supposed to do, by sticking with the AAPC through even to today. The story behind "Born In The Wrong Country" is of feeling unwelcome. Having suffered so much by the hands of this government, along with all the violence and bigotry, one can’t help but feel unwelcome in his country. It is a book about many things; some of the areas that it focuses on are some of ills of this country, past and present. At the heart of these ills is slavery in America, terrorism relating to that slavery, and America’s unrelenting arrogance. Born In The Wrong Country speaks about an apology that was never made to the African-American people of Color; it also speaks of hunger, both mental and physical. Discrimination is also a key factor of "Born In The Wrong Country,” as racism seems to be running rampant. 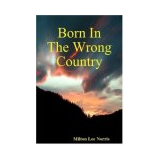 "Born In The Wrong Country" speaks of the mistreatment of Blacks, other minorities, poor whites and the disenfranchised in this country, which have all been affected by the arrogant hand of this nation. Born In The Wrong Country speaks of what is simply thievery. It tells how this government in essence stole our food, would be health insurance, and many means of making a living from the American people. "Born In The Wrong Country" points out the flagrant spending of multi-billions of dollars on the Iraq war, which was created under the Bush administration. One issue that is close to the authors' heart is parenting. “Born” speaks of the importance of being a good parent and a friend, especially to gay children, who still love their parents and would like to count on them. It’s about our wonderful gay men and women, who many like the author, just want to be wanted and loved by their families. “Born In The Wrong Country” is about gay people, straight people, and people who are need. “It seems as if I am feeling the pain that my mother, my father, my grandparents, great-grandparents, and great-great-grandparents felt,” Milton Lee Norris writes. The ramifications of chattel slavery and institutionalized and intractable racism in the United States have never been thoroughly studied. In social critic Milton Lee Norris’s stream of consciousness book—really an open letter to white America—the residual pain, humiliation, and righteous anger call from the pages. In this deeply personal book, written in the aftermath of the attacks on the U.S. on 9/11 and the subsequent wars on Afghanistan and Iraq, Norris, a first-time author, explains how he, as an “African-American Person of Color,” feels about the present condition of Black people. His sense of betrayal from repeated repression including slavery, the failure of reconstruction, the climate of fear in the age of lynching, Jim Crow laws, segregation, entrenched racism, and ignorance and intolerance from the majority of white people has the essence of a red hot truth that has never been completely discussed or eradicated in the United States. The book is a traditional polemic. He calls for better healthcare, housing, education, assistance to the poor, justice, internationalism, and gay marriage. He makes the argument that “America,” as an idea, has moved (perhaps to Iraq, where all of the money seems to be going) and deserted her people. While the strength of the book is its politics, its weakness is in the tone. When Norris explains issues and uses stories from his own life or the lives of others, his points come alive. Unfortunately he doesn’t use this technique often enough. Instead of giving the uninitiated reader something to grab onto to increase their understanding, they are left with rhetoric. Norris’s passion for life and his deep sense of how things should be shines through. He also reveals himself as a vulnerable man who loves self expression and thought and who feels the bone-deep pain of discrimination and the historically significant ramifications of slavery. Norris asks, “Do you understand that slavery had an effect not just on the bodies, but also on the minds and spirits of a once highly spirited people?” Unfortunately the answer he finds most often is: No.